Josh Siegel of Bailiff. Photo by Zurina Ketola. 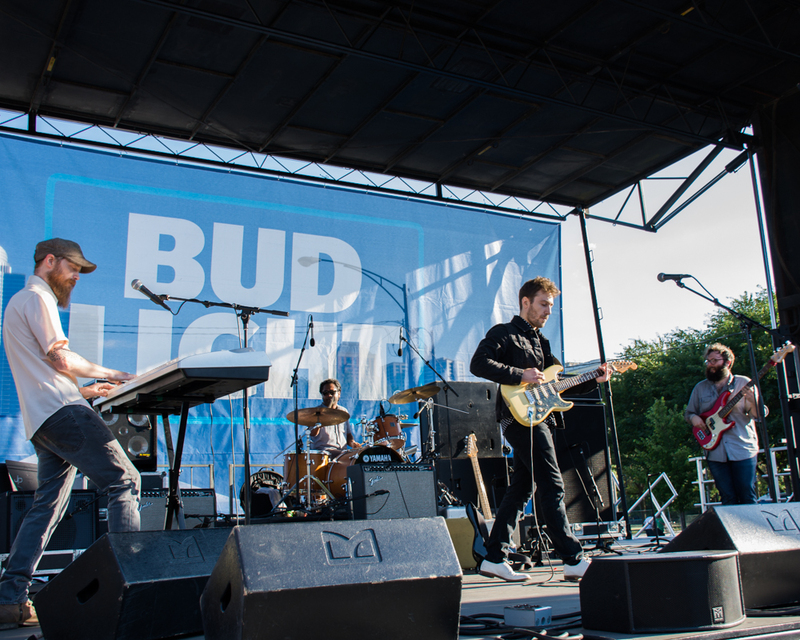 If the album Chicago indie band Bailiff is working on is anything like their set Saturday at the Taste of Chicago, music lovers will be in for something special. It’s been three years now since they dropped their last album, (they did release a 7-inch last year), and since their 2014 sophomore effort “Remise,” they have gotten a new bassist — Brian Weakly, who fits in well with Josh Siegel and Ren Mathew to complete the trio. On Saturday, as they often do at their live shows, they had a fourth, enlisting Joe Swierpski to play rhythm guitar and keyboards. Bailiff at Taste of Chicago. Photo by Zurina Ketola. They opened with the song that may best epitomize the band — “In the Reverie”, off their 2011 debut Red Balloon and Siegel, decked out in black jeans and a black jean jacket on a humid day, seemed the be the only person who didn’t break a sweat. They continued the hour-long, 11-song set with “Love Like Mine,” the anti-war “Helicopter,” “Curtains,” “Lookin’ Away,” along with a few new songs off the new album that Seigel said should be out in the fall. Additionally in the fall, anticipate more concert dates from Bailiff. When they are announced, do yourself a favor and clear your schedule. Also read our 2014 profile of Bailiff.